Friday Wrap-Up – New Beers from Petit-Sault, YellowBelly, Picaroons, Big Spruce, Railcar, Meander River and more! • There’s a new beer on the way from Brasseurs du Petit-Sault; coming out in a few days, it honours the departure of the KB882 Lancaster Bomber from Edmundston. The plane, which was responsible for many allied runs to occupied Europe during World War II, is being dismantled and moved to the Alberta Aviation Museum this summer. Lancaster KB882 is a special-edition “Amber Lager” brewed in the style of a Marzen/Oktoberfest. Starting off a bit sweet but finishing dry, it features a bready malt backbone, and is hopped to 23 IBUs with Hallertauer, a German noble variety, providing a light, supporting bitterness. Lagered for 6 weeks, it’s an easy-drinking beer with a sessionable 4.6% ABV. Look for this one to be released this Monday, March 30th, at the brewery for growler fills; it should follow shortly at select ANBL growler stations as well. • YellowBelly Brewery has released their Unite Red Ale, brewed as part of the International Women’s Collaboration Brew Day. The guidelines from the Pink Boots Society suggested a 4.5% Red Ale with 50 IBUs using Willamette, but creative license was encouraged. To achieve these targets, Maris Otter and Extra Dark Crystal were used in the mash, along with a bit of Briess Midnight Wheat™ for colour. As wheat has no husk, there is no astringency or grain-based bitterness that may arise from other dark roasted cereals. To increase the hop bitterness level, higher alpha acid Mosaic hop was used early in the boil, to accompany the lower AA Willamette (with Mosaic also being used in the dry-hop). The resultant aroma is reminiscent of fruit punch, with notes of passionfruit and lychee up front, and lingering pink grapefruit. Overall, the beer tastes like more! The brewday report from Brewmaster Liam McKenna describes the many enthusiastic participants enjoying a beer brunch, taking turns in the brewhouse during the process, and even having a chance to do a hop drop. Money was raised for the Newfoundland Sexual Assault Crisis and Prevention Centre, and there are already plans to make this an annual event. The Unite Red Ale is on tap now at the brewery, with bottles coming to the brewery and NLC early next week. And a quick note that the next batch of YellowBelly Pale Ale, expected to hit the taps on Wednesday, also incorporates Mosaic for late- and dry-hopping, as a treat for the Island’s fruit juicy hop lovers. • Picaroons has released another one-off beer featuring an interesting ingredient: kelp! When approached by Dr. Thierry Chopin of UNB-SJ about brewing a beer featuring the brown algae, the Picaroons staff happily took on the challenge. Brewed with organic sugar kelp harvested off the shores near St. George, Kelp on the Way also includes a “strong malt backbone” of Golden Promise, Dark Crystal, Roasted, and Smoked malts. Hopped with Fuggles and Goldings to 22 IBUs to help balance the sweetness, this 5.8% ABV beer is described by the brewery as dark, malty and smokey. It was released earlier this week, exclusively at the Brewtique for growler fills; if there’s still any left, get down there to give it a try before it’s all gone! • There’s Big things brewing at Big Spruce! Yesterday was the brewday for their first ever lager, and they chose a special style, a Maibock. And if that wasn’t enough, they added the zest of 40 lemons to the boil, and will add the same during conditioning. The grist is primarily Pilsner malt, with Munich added for colour and flavour. The hops used included Magnum in the first wort, some Big Spruce-grown Galena for bittering and Challenger for flavour, for an estimated total 35 IBUs. After fermentation is complete (done using a Bavarian lager yeast), the beer will lager for 4-6 weeks, and be released during NS Craft Beer Week, May 8-17. • In more Big Spruce news, they teased the upcoming brewing and release of a brand new beer coming in the summer. Based on notes from Alexander Graham Bell, they will be releasing a sour raspberry wheat ale. Bell spent more than 30 years living in Baddeck, and a Parks Canada National Historic Site in Baddeck bears his name. His notes describe an interesting tart drink with raspberries, and Big Spruce was approached to produce something in that same vein. The sour character of the brew will be accomplished using the kettle souring technique, using Lactobacillus to ferment the wort and give a tart and acidic character not available from brewer’s yeast. We will have more on this beer, which will be released in coordination with The Bells of Baddeck, a musical drama running during the month of July. • And finally in Big Spruce news, their Island Conspiracy, brewed with BarNone Brewing’s Don Campbell, is now available. This Double IPA, weighing in at 8% ABV and 97 IBUs (bittered with Magnum, flavoured with Bravo, Citra and Cascade, with these last two hops also used in aromatic additions) hit the taps at Stillwell last night, and is available on tap today at the brewery today for growler fills. Look for it on tap elsewhere in fine bars across the province, and rumour has it that BarNone may brew it at their brewery for release in PEI at some point. • While Railcar Brewing‘s opening at their new location had been slightly delayed to around April 1st, they’re still busy brewing new beer. The latest one-off is Smoked Maple Porter, an 8%ABV dark ale with a grist consisting of several malts: 2-row, Chocolate, Black, Brown, Carafoam, Crystal 120 L, and, of course, Smoked. Hopped with Fuggles and Centennial to 22 IBUs, the beer also had 2 L of maple syrup added while in the primary fermentor. Look for this one to be on tap at the new 6-tap tasting room once it opens in the hopefully-near future. And owner/brewer Mitch Biggar has a lot of new beers planned, including an Orange Cranberry Rye, Chipotle Chaga Porter, and an 8-hop version of their Trainwreck IPA; we’ll be sure to keep you updated as these beers are brewed and released. In the meantime, the brewery itself will be open tomorrow-on for growler fills of their Artisan Brown, during regular hours (Mon-Sat noon – 10 pm, Sun noon – 5 pm). • Meander River Farm and Brewery is having a special release this weekend, their first Cider! A blend of Cortland, McIntosh, Honeycrisp and Golden Delicious apples have gone in to this first batch of cider, finishing at 6.5% ABV. Citrus and apple notes are predominant in the cider. This is a very limited release, with only 200 litres available; it is expected to sell out this weekend at the Brewery (though it will make a brief appearance on tap in Halifax, as well). Going forward, they anticipate making cider a part of their rotating offerings, with Meander River’s own fruits and wild apples possibly making it into the recipes. • This is a busy weekend at Meander River, as it is also the return of their Smokey Chipotle Porter, first released in October 2014. The malt bill features Cherrywood Smoked Malt, along with darker kilned malts for a smoke and roast/chocolate character. Chipotle peppers were added late in the fermentation for an additional smoke character, as well as a spicy punch and pepper flavour. The peppers were left in the beer longer this time for a bit more of a kick. They also announced that they have brought in two additional conditioning tanks, allowing them to brew more often, and effectively triple capacity to 450 hectolitres per year. • Summer is still a few months away (and let’s be honest, it feels even longer than that), but there’s some good news for beer fans living in Fredericton for the season: those behind the recently-redefined James Joyce Pub are planning a summer craft beer garden at the Lighthouse on the Green downtown. Right now, plans are to have 3 taps pouring – two Picaroons, and one NB-brewery rotating tap – along with a BBQ on the deck for food purchases. Details are still being ironed out, but expect the beer garden to open with limited hours around mid-June, and then all day (11 am – 10 pm) in July and August. We’ll keep you updated on its progress; be sure to follow the Facebook link for the Lighthouse above, as all updates/beer notices/etc. will flow through there. • Calling all Islanders… PEI’s newest craft brewery, Upstreet Craft Brewing, needs your help! In preparation for their grand opening later this spring, they’re looking to include something “different” in each bottle when they begin packaging their beers: “Islandisms” (“Islanderisms?”) under every cap! They’re asking for your assistance; any PEI-specific phrases, quotes, jokes, etc. you can think of are fair-game, as long as they’re relatively clean! You can suggest as many as you like via Twitter, Facebook or Instagram; just be sure to include the hashtag #UnderTheCap. The best 250 will garner laughter and fame in future bottles of Upstreet beer! Get cracking, you have until next Friday to submit your ideas. • Tickets go on sale today for Sunset Heights’ first Still Mead release, scheduled for the afternoon of April 11th. The event will feature Mead pairing with chocolate and cheese, and first availability to buy one of their four new still meads released at that time. Each attendee is able to purchase up to two cases, and will have first access to tickets to the upcoming Summer and subsequent release and tasting events. Be sure to check their Twitter feed to get first crack at the tickets when they go on sale at noon, as they are limited to only 36! • Tom’s Little Havana announced earlier this week that they will be hosting their first Tap Takeover, and it will be by perennial favourite Bad Apple Brewhouse. Over four days, beginning May 14th, there will be five different BAB beers on tap, with a special cask being released each day. No tickets required for the event, just show up to enjoy great beer and food. • Rockbottom Brewpub has released their newest beer, Freudian Slip Vienna Lager. A light and crisp golden lager, it features toasted malt and spicy and herbal noble hop characters. It weighs in at 5.5% ABV and 30 IBUs. • Boxing Rock has brought back their very popular La Rive du Sud, first released in May 2014. This Biere de Garde style beer is a malty, lagered beer (though initially fermented with an ale yeast), with origins in France, where the summer months were too hot for brewing, so beer was brewed and stored in the cellar during the cooler months to enjoy once the weather warmed. It features light base malts and dark caramelized sugar, and is 7.5% ABV. Available at the brewery now in bottles and growler fills, bottles will be available this weekend in Halifax (and growlers at the Seaport Market), and on tap at select bars soon. And their The Next Chapter Rye IPA has finally hit store shelves this week, and is moving fast. Check here for availability at your local ANBL. • Hammond River’s Switchback Brown Ale is being featured at the ANBL Growler fill program this week. This is the first time in a while that Hammond River has brewed the hoppy American Brown; the same recipe has been used, since the beer was so well-received during its first run. Head to the Kennebecasis Valley ANBL to pick up a growler, as the beer will be available exclusively at this location. And they’ve recently brewed the last batch for this season of their Breakfast Stout; this brew features the Java Moose coffee, oats, cacao nibs, and home-smoked bacon as before, along with a few eggs being added this time (to the mash) to make your “breakfast” complete! Finally, look for their Hawaiian Pale Ale (brewed with fresh pineapples) to be available again soon (it will be debuting for the season at this year’s Saint John Beer Fest on April 11th). Enjoy your weekend! Garrison has a new one-off beer, Cranberry Hibiscus Wit, available at the brewery for growler fills; tart and sessionable at 4% ABV. Big Tide has an unfiltered version of their Seaworthy IPA (featuring Nugget and Cascade hops) on tap at the brewpub. Shiretown’s Black Currant Wheat is back, available for growlers fills at the brewery, and on tap at the Heron’s Nest Pub. And the new batch of TrailWay Brewing‘s Session IPA is now available at King Street Ale House, James Joyce, and at their newest account, Brewbakers. 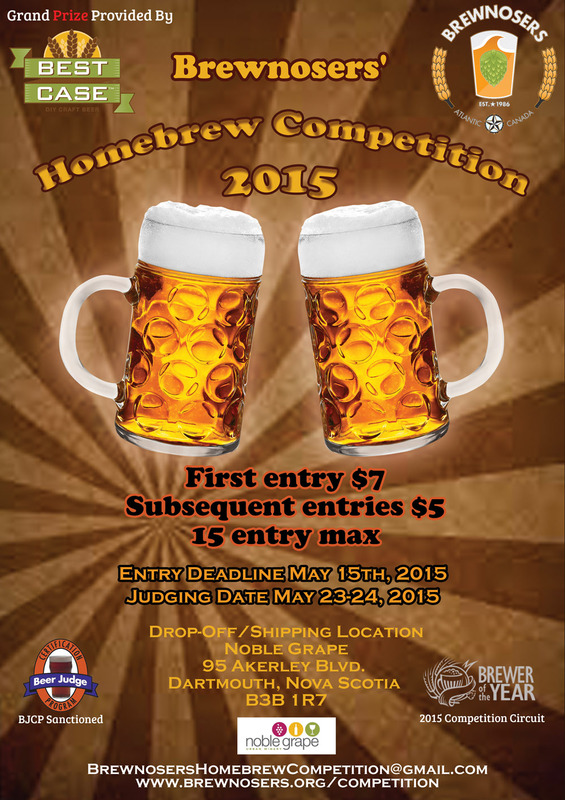 The Brewnosers Homebrew and Beer Appreciation Club is hosting an Amateur Brewers Beer Competition May 23-25, 2015. While the Maritimes has seen an explosion of commercial breweries opening in recent memory, the homebrewing community has seen similar growth. A combination of new beer drinkers, those realizing not all beer is “fizzy yellow lager” and looking for beer with more taste, and those who enjoy the DIY culture and want to add beer to their repertoire are just a few of the groups to thank for this explosion. As Craft Beer grows, so does the Homebrewing community, and vice versa, as many commercial brewers start out as homebrewers looking to turn their passion into a career. While getting comments on homebrew from family and friends is nice, it can be difficult to receive impartial feedback, especially if the beer is free and plentiful. Enter homebrew competitions, where homebrewers can receive honest feedback from judges drinking their beer blind, without any preconceived notions. Local breweries have supported this idea by giving homebrewers an opportunity to do that for years (Garrison Brewing, Big Spruce, Gahan House Charlottetown, and Hammond River to name a few), but those competitions are usually restricted to one style, as the winning brew will be turned into a commercial beer. With 23 categories and more than 80 sub-categories recognized by the BJCP, many homebrewers brew outside of these single styles. This is where homebrew clubs come in! For more than 30 years, Canadian amateur/homebrew clubs have been holding competitions to allow entrants to receive honest feedback on their brews, earn some bragging rights, and maybe some cool prizes at the same time. Annual club competitions are hosted in Vancouver, Calgary, Saskatchewan, Montreal, and many cities in between. In Halifax, the Brewnosers have previously hosted All About Ales in 1999, a combination homebrew competition and conference at John Shippey’s Brewing Company and Rogues Roost, but have not hosted an annual competition until now. Thanks to passionate Brewnosers members willing to donate their time to organize and judge the competition, Canada’s East Coast will become an integral part of the homebrew competition circuit. One driving force behind the renewed interest is Jeff Pinhey, one of the original Brewnosers members when the group formed in 1986. As a National ranked BJCP judge, he has lead study groups and beer seminars in our region, including guidance and study assistance for a crop of a dozen new BJCP judges in 2013. The Beer Judge Certification Program is an international non-profit organization encouraging knowledge, understanding, and appreciation of beer, by offering a standardized method for evaluation, ranking, and giving feedback. There are more than 15 BJCP judges in our region, who have taken both knowledge- and tasting-exams, and most of them will be taking part as judges (or participants) in this homebrew competition. Registration for the Inaugural Brewnosers Homebrew Competition is now open, and accepting entries from amateur brewers from across the country. All BJCP beer styles are welcome, and will be evaluated by a team of BJCP-certified and industry-member judges. As the name implies, only beer brewed by amateur brewers, on non-commercial systems may enter (commercial brewers can/should enter the CBAs, whose registration ends April 1st). The competition is also registered as part of the Brewer of the Year, which tracks amateur brewing competitions across Canada. All entrants will receive honest feedback on their entries by means of scoresheets, and the top entries in each category may be eligible for prizes from competition sponsors. The Best of Show winning brewer will have the opportunity to work with Best Case Beer to produce a DIY Craft Beer kit from their winning beer, to be sold at homebrew shops across Canada. Other sponsors, as of publishing time, include Bad Apple Brewhouse, Big Spruce Brewing, Breton Brewing, FastRack, Garrison Brewing, Ladies Beer League, Schoolhouse Brewery, Wrought Iron Brewing, and we here at the ACBB, with more groups expected to assist with category prizes and other sponsorship. The deadline for registration is May 15 at 5pm, and must be done online at www.brewnosers.org/competition. Samples (2 bottles of each entry) may be dropped off at any Noble Grape (in the HRM and in Coldbrook and Fredericton, with the Burnside location being the central point for accepting mailed entries) before the same deadline. Costs are $7 per entry (and $5 for subsequent, via online payment only), and the number of entries is being capped at one per sub-category and 15 total per entrant, and 325 overall. As of publishing time, there are more than 150 entries registered, from brewers across the country. If you are interested in supporting the competition by means of sponsoring a category, or donating funds, merchandise or time towards the prizes and logistics of the competition, please contact Competition Coordinator Andrew Newton. The goal of the organizers is to have the competition break even, while providing the entrants, judges, and supporters a valuable and worthwhile event.